Tinea Versicolor, also known as pityriasis versicolor is a skin infection caused by fungus. It is found mostly in young people. Any person infected with this will have discolored patches on his skin. These patches can be light or reddish-brown in colour. It is neither a permanent nor a serious infection. 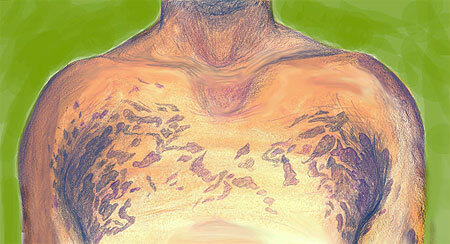 Tinea versicolor mainly affects skin on the chest and back. It affects only the top layer of the skin. It is a non-contagious disease. The tinea versicolor rash generally appears on the chest and back and is more common in adolescents than in adults. The fungus that causes the infection feeds on the natural oils that are found on the surface of the skin and so it is theorized that people with an oily skin have a higher risk of suffering from tinea versicolor as compared to those with a dry skin. Tinea versicolor is thought to be the most commonly occurring type of fungal skin infection and can affect adults although most prevalent in adolescents, unlike pityriasis alba, which is more prevalent in children. As indicated tinea versicolor is a fungal infection caused by the same group of fungi, responsible for some of the most common types of fungal infections. Tinea corporis, more commonly known as ringworm, tinea cruris or jock itch, tinea pedis or athlete’s foot, and the less common tinea nigra are all part of the tinea family of infections. Tinea infections are therefore the most prolific and commonly found dermatological condition across the world. Fortunately most tinea skin infections are non threatening and if treated appropriately and in a timely manner can be cured quite effectively. Unfortunately all of these skin conditions cause similar and often overlapping symptoms although they do have some distinctive features or symptoms that make them identifiable. Ringworm for example cannot be confused with any of the other tinea infections because of the distinctive ring or circular shaped rash that it produces. If you do have trouble identifying the rash and would simply like to make sure it could help to search for tinea versicolor photos or pictures on the internet to get a better idea of the appearance of the rash. Fortunately, unlike most other common skin fungus infections, tinea versicolor is not contagious. This is because strangely enough the fungus responsible is in fact a part of normal healthy adult skin. The condition can therefore affect otherwise completely healthy adults and is caused by the yeast Malassezia furfur, which thrives in the skin of most adults. It only becomes a skin condition when in conditions of high humidity or hormonal or immune system imbalances or abnormalities, it causes skin discoloration or spotting. Tinea versicolor in fact takes its name ‘versicolor’ on account of the changes it causes in skin color. The appearance of white spots on the skin typically accompanies the apparent discoloration. Tinea versicolor infections typically affect the shoulders, back and chest, but can also be present on folds of skin, including areas like the region beneath the breats, towards the groins and also on the crook of the arm. Tinea versicolor symptoms usually do not manifest on the face, but in children this could also be a symptom. The severity or intensity of the symptoms can vary greatly between individuals, with some individuals having just a few of the white spots appearing, while others may have so many white spots that it would appear to be normal, while the pockets of normal skin would appear to be problematic instead. Tinea versicolor treatment with over the counter topical applications can be quite effective and can be used in combination with a variety of home remedies. The treatment needs to be kept up for at least two weeks. A recurrence of the infection is inevitable however and although you can try applying selenium sulfide or ketoconazole shampoos over the affected area, this will not help with tinea versicolor prevention, but will simply delay it till much later as the condition tends to recur after as long as a year. The most common symptoms of tinea versicolor are light brown or white patches on the skin. These patches are most noticeable during summer season. Rashes on the trunk are one of the symptoms. Generally rashes of tinea versicolor do not appear on the face. Itch on the patches, which become more intense with sweat or overheating. The rash caused by the tinea versicolor fungus can sometimes be mistaken for other skin conditions and rashes such as vitiligo. A tinea versicolor infection generally causes a distinctive pattern with larger patches of discoloration surrounded by smaller spots. An individual with tinea white spots may also experience slight scaling of the affected area but this will produce a very fine powdery dry skin layer and not thick scales as is common with other skin infections. Tinea versicolor itching is uncommon in mild cases but may be present in moderate to severe cases. Another peculiar feature of the tinea or pityriasis versicolor rash is that the affected patches are most prominent when the skin is slightly hotter than usual. Thus, it is very easy to spot tinea versicolor patches if an individual has been exercising or has been in for a hot shower. This change in color is most noticeable in people who have darkened patches of affected skin as compared to those with lighter patches. The border of the affected patches is very easy to distinguish and is the same color as the rest of the patch. This is another important aspect of the tinea versicolor yeast rash as most other skin conditions cause rashes that have darkened edges. Tinea versicolor and ringworm are often mistaken for each other and this can affect the results of the prescribed treatment. The dermatologist may recommend a KOH Preparation which is a test that is used to determine the presence of a fungal infection and to isolate and establish the exact type of fungal infection. Tinea versicolor is caused by a yeast called Malassezia furfur. It is a type of fungus. This yeast likes fat; therefore tinea versicolor is common among people with more sebaceous glands. This fungus is present almost everywhere in environment. It is also present on human skin. But during summer season or high temperature it grows rapidly. Due to this rapid growth the natural balance of the fungus is disturbed, causing patches on the skin. There are several allopathic medications as well as home remedies for pityriasis or tinea versicolor. Once you get rid of tinea versicolor, the patches on your skin will start to fade and your skin will regain its smooth complexion within a few months. If the condition has been neglected for a prolonged period, the discolored patches of skin may be very prominent but there is no cause for distress as these patches are not permanent although they may take a while to completely fade away. Skin fungal infections are sometimes a little stubborn to treat as fungus thrives easily on human skin. It is therefore necessary to follow your entire treatment course faithfully as skipping treatment may cause the condition to regain a foothold and so it will take longer for the discoloration to disappear. All types of fungus require a moist environment along with natural oils from the body to thrive. Since the tinea versicolor cause is a fungus it is necessary to follow good hygiene practices and ensure that your skin is clean and free of excess moisture at all times. Some factors like pregnancy, burns, oral contraceptives, malnutrition and steroid therapy may contribute to tinea versicolor. These may not be actual causes of tinea versicolor but they would increase a person’s risk of suffering from the condition. Furthermore, there are several tinea versicolor cures that may not be suitable for an individual with tinea versicolor that has been caused or aggravated by an underlying medical condition. For example, Selenium Sulfide which is often used to treat tinea versicolor is generally not recommended for pregnant women. It has been classified as a Pregnancy category C medication and if you are pregnant you could use a Selenium Sulfide lotion or cream only if your doctor has specifically recommended it. Treatment for tinea versicolor depends upon the overall health, age and medical history of the infected person. Since tinea versicolor is caused by fungus, you can apply OTC antifungal creams twice daily. Apply antidandruff shampoo that contains selenium sulfide on the patches. Take bath daily, this will remove dead cells and fungus from your skin. Make sure that you use a soft scrubber or a loofa as this will help to get rid of the upper layer of dead skin which contains the fungus. You could have a shower with lukewarm water or slightly warm water but avoid bathing with hot water. Hot water showers tend to strip the skin of all its natural oils and this causes the sebaceous glands in your skin to produce excess sebum. Ketaconazole is a very effective treatment for tinea versicolor and so you could use a shampoo containing this fungicide to help prevent the spread of the skin discoloration. You could also use a tinea versicolor cream or medicated lotion to decrease recovery time. There are also several tinea versicolor natural treatments that you can prepare at home as these home remedies for tinea versicolor are extremely gentle and will also help to rejuvenate your skin. It is advisable that you follow a regular skin care schedule that includes several homemade remedies for tinea versicolor. You can make a homemade body scrub for tinea versicolor by lightly grinding a handful of unpolished rice so that you obtain a coarse flour. You can add a few spoons of fresh tomato juice to this flour until it forms a paste. Shower as usual and then apply this paste all over the affected areas of skin. Allow the paste too remain on your skin for about 5 minutes and then gently massage it into your skin. The tomato juice is acidic in nature and this prevents the spread of the fungus. The rice flour contains several nutrients that are essential for skin health and since it is also coarse it serves as an exfoliating agent. You may also use apple cider vinegar for tinea versicolor as vinegar is acidic in nature and provides a hostile environment for fungus and thus helps to control the spread of the infection. When treating tinea versicolor with home remedies, it is important that you keep in mind that it may take a while for your skin top regain its original color. Tea tree oil is a very potent natural fungicide and there are several tinea versicolor tea tree oil remedies that you can use to treat this condition. It is important to dilute the tea tree oil with a carrier oil before you use it as tea tree oil is an essential oil and contains very strong natural compounds. Mix equal quantities of tea tree oil, olive oil, and sweet almond oil and use this blend of oils after your shower instead of a moisturizing cream. Selenium Sulfide has been proven to be very effective in the treatment of tinea versicolor and so there are several tinea versicolor remedies that involve the use of Selenium Sulfide shampoos. The Tinea versicolor selsun blue remedy is one of the most commonly used tinea versicolor treatments and when used for a prolonged period has remarkable effects. To use this remedy, you will need to stand under a warm shower for a few minutes and then lather your body with this shampoo. You would need to leave the lather on for 5 minutes or so and then use a loofa to gently exfoliate your skin. You can repeat this procedure once more on the affected areas of your skin. This tinea versicolor selsun blue remedy will help to treat the condition as well as prevent it from spreading. You can also continue to use this remedy twice a month for the next few months as it is also an excellent preventative method and will prevent the recurrence of tinea versicolor. Even if you know how to treat tinea versicolor, it is best that you speak to a dermatologist before your decide on a treatment method. Tinea versicolor on the face is very rare but when it occurs it can be extremely prominent as facial skin tans easily. When you have tinea versicolor, tanning in any form should be avoided. Sunbathing at the beach and tanning beds will only make the discoloration prominent. There has been a lot of research towards finding out if tinea versicolor is contagious and unfortunately there is no definite consensus. Since the fungus that causes tinea versicolor is naturally present on our skin, it would obviously follow that it wouldn’t really be considered contagious. However, some studies have found that people who frequently share personal items like clothing have a higher risk of contracting this skin condition. So although tinea versicolor is not considered to be a contagious skin condition, it would be best to avoid sharing personal items as far as possible. Those who have tinea versicolor should eat a balanced and a healthy diet. A healthy diet and good hygiene will help you to prevent reoccurrence of tinea versicolor. A tinea versicolor diet generally consists of foods that are fresh and it is better to avoid processed foods as far as possible. Fried food and junk foods can aggravate this skin condition and so it would be best to avoid them completely until your skin has cleared completely. Include raw fruits, raw vegetables and whole grains in your diet. This will strengthen your immune system by providing antioxidants. Have plenty of tomatoes, grapes, and citrus fruits on a daily basis as these are all excellent sources of antioxidants. These foods are also rich in several vitamins that are essential for healthy skin. Include lactic acid fermented food like yoghurt in your diet; it contains acidophilus which helps to maintain bacteria level and helps to prevent the spread of infection. It is best to avoid sweetened yogurt as the sugar could actually aggravate the infection and instead you can use a few spoons of honey to sweeten a bowl of yogurt. You can also blend fresh fruits and yogurt as this will help to add variety to the yogurt. Avoid too much of white flour and sugar. Bakery products like pastries and cakes should be avoided completely. Garlic is a very good antifungal agent. Try chewing one or two cloves daily. Treating tinea versicolor may not get back your original skin color immediately. Once treated tinea versicolor may reoccur. Use baby powder to keep yourself dry.